The impression of fragility and vertical imbalance, the thin and elongated arms and leg, and the subdued pastel coloring of the figures are like an anatomical reconfiguration of Gothic architecture. Claire Stoner's figures are like a sigh of nostalgia for the spiritual, the quest of those, like children, who are pure of heart--the name she gave to this collection. Exhibition label originally written by Fr. Johann G. Roten, S.M. 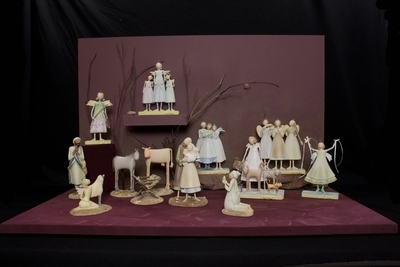 for exhibit entitled "At The Manger" and held at Roesch Library, University of Dayton.